This playground is empty – waiting to provide all the challenges for brain and body development to a child you love. YOU are the missing piece. So put a smile on your face. Find your childlike self and invest in the play! Then wait for the results…. Children consider playground activities “circus performances” and they hunger for recognition. Children will typically flock to an adult who understands the nature of this situation and who encourages challenge and expressive fun. I am so excited to feature the world of Dr. “Fun” Lyelle Palmer. Use language to build your child’s strength of character. Words to share with our children to create excitement and encouragement? Goal: Children are encouraged to work out on the playground equipment by the presence of an adult. The greatest luxury of a child is to have an adult who will watch the performance with full attention. By full attention, we mean that the adult is looking and commenting to the children, rather than reading, talking to another adult, or being distracted or absorbed by internal thoughts unrelated to the children. “Being present to the children” is another way of describing this full attention condition. Adults should verbalize action or use emotional sounds or exclamations in order to intensify the experiences. For many students, the activities introduced at school will be a first experience and the only opportunity for participation. Here are some verbal tools for adults to use in interacting with SMART children. You are hanging upside down. You are climbing up and up. Look at you flip on the bar. I see you hanging upside down. You are locking your feet under the bar. I see you keeping your feet on the board. You are tying your shoes. Good job. Give me five! Now I want to see how you jump rope. Now it is time to use the overhead ladder. Everyone is hanging. That must be fun. I’ll bet you can’t hang upside down. You’ll really fool me if you can jump rope. Don’t let me catch you doing flips. Bars are not for jumping from. Gravel is not for throwing. We give others a chance to swing. Children are not for hitting. We go to class in three minutes. You have five/two minutes left. Now it is time to do flips. You will want to do this again and again. You will hardly be able to wait to come back here. I remember how you flipped yesterday. You like to see the world upside down. It’s a bit frightening to do this the first time. It’s exciting to finally be able to do it. It is maddening when that happens. It is scary to think it might happen again. You are really proud of yourself. You are having a happy time. Remember the rule: use both hands. Our rule tells us to always line up one by one. 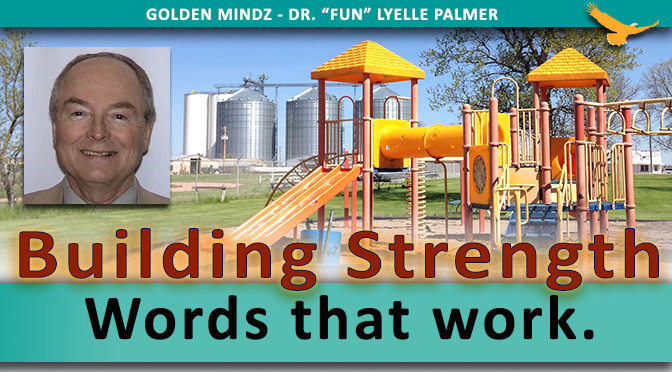 This entry was posted in CHALLENGE, CHERISH, CONDITION, COOPERATE, CURIOSITY - CHILDLIKE, DEVELOPMENT, DR. FUN - LYELLE PALMER and tagged brain, child, development, Dr. Lyelle Palmer, fun, language, outdoor, play, playground, sensory diet, strength.